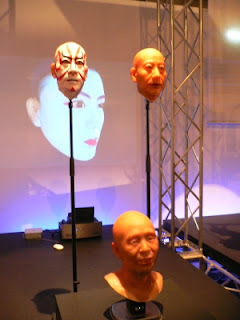 The exhibition hosts a large variety of things and ideas connected with robots, beginning with movies like Metropolis and the first novels and comics dealing with the idea of robots. 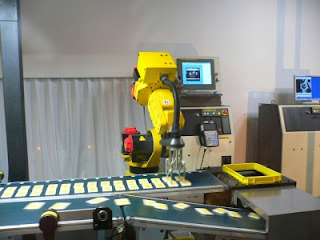 The term itself came up in a play in Czech were writer Karel Čapek raised both the idea of artificial humans, which he called robot (they were more closer to androids by today's concepts) and the idea of them being exploited by humans. 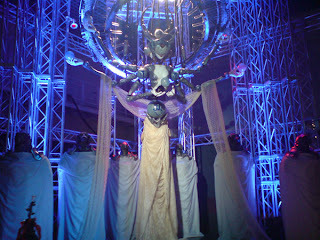 An idea which follows us until today in recent works about robots, like the Mang/Anime universe of Ghost in the Shell. 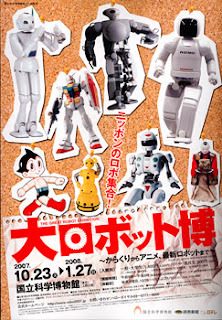 The exhibition continues with toys and figures, which are featuring robots from the first appearance in Japan in the Manga Astro Boy by famous 治虫手塚 Osamu Tezuka, often considered the father of 漫画 Manga, to figures of the long running Gundam series. 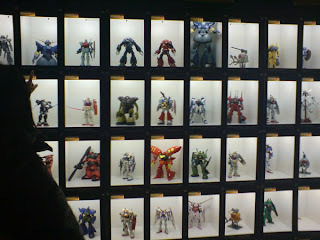 After this introduction we enter the main hall of the exhibition, which hosts the actual robots and all kinds of that. They range from useful and a great aide to human life, like a robotic wheelchair for the handicapped or little helper robots for elderly people, to field and track robots being able to overcome a nasty landscape and finally robots simply displaying the technological state of their researchers. 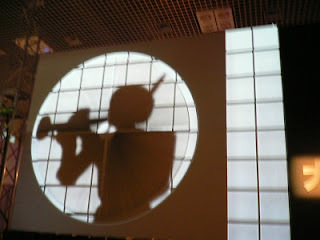 The highlight of this hall is without doubt Toyota's partner robots, who make a real stage performance all of their own greeting everyone, holding a speech and announcing a performance of Christmas songs played by trumpet. Because their most renowned highlight is to be able to play human instruments from trumpet up to violin. For me the second highlight however was an unexpected finding of Japanese "robots" from the mechanical age, that means no electricity all sparrow powered. The high skills of those artists found their peak in a "robot" of a 弓道 archer Samurai, who with the sparrow pulled tight, will consecutively take three times an arrow from his waist, put it into a real tiny bow, tighten it and shot at a distant target with a high precision! To achieve such precision with wheels and chains is really amazing! 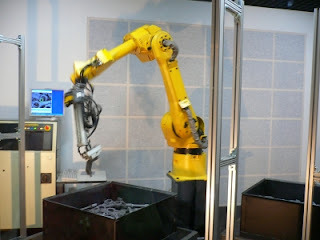 Finally you could also stand amazed before a huge replica of dark Cyberpunk SciFi dreams modeled into dark and scary real life or watch an actual manufacturing robot spot the tiny holes in construction parts and grab them with a 100% precision in milliseconds of time. The speed and precision was so amazing, that it was actually scary to watch. After a merchandising shop we could take the stairs to the second floor, entirely dedicated to Honda's Asimo (Most probably named after Isaac Asimov, one of the greatest Science Fiction authors after Jules Verne). 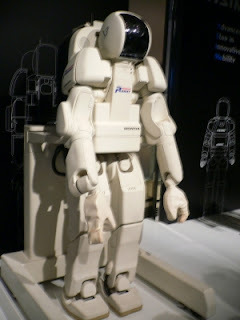 Asimo (IV), according to Honda, is already almost able to execute an amazing variety of difficult tasks and interact with a family. To illustrate that we could watch another real life performance of Asimo trying to follow the requests of his test family members. 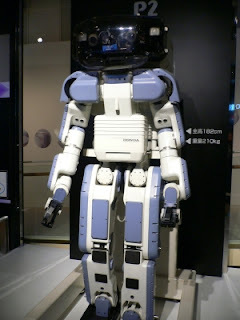 The father forgot his keys, calls Asimo and asks him, whether he left them in the living room. Asimo searches for them and is able to find them and bring them to the father. Yatta! The mother tells Asimo that she expects her friends to come over and asks him to prepare the table and their friends favorite drinks. He does as told, looks the favorite drinks up in his conversation database (a database filled with things he learned in real conversation) and prepares them. Yatta! 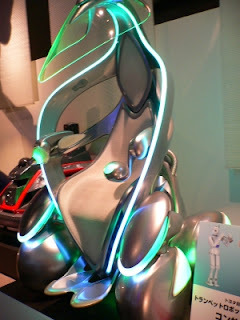 The daughter tells Asimo that she will have a date tonight, and that her date wants to dance with her. However she is not good in dancing and wants to practice with Asimo, thus she asks him to learn a certain dance, until she is back. This should probably illustrate the ability to download/extend Asimo's capabilities with new ones using the internet; In the performance however he watches a video of a dancing instructor and then mimics the movements (which is unrealistic without human intervention imo). Yatta! Finally the son calls and tells him, that his friends called off the soccer playing, but he really wants to play. If he could play soccer with Asimo. 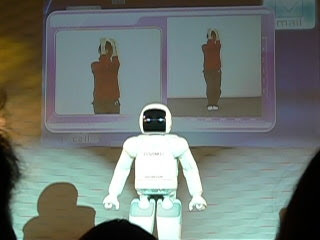 Asimo agrees and shows to the audience (us) that he is not only able to kick the ball, bt also to run around the stage really quickly, a thing having been unable to two legged robots until very recently. Yatta! When we leave the exhibition, without noticing, we entered the Ueno National Museum and found ourself between dinosaur skeletons, ancient stones and a chronological evolution of human tools. Just as we started to become fascinated the 6 o'clock jingle told us to leave the museum. Outside a huge real sized blue whale said Good Bye to us and we left the world of marvels. Isaac Asimov's pre-Empire novels “The Naked Sun” and “The Robots of Dawn” offer a nice and pretty realistical view on what role robots one day might play in our society. added both to my "to read list", thx for the recommendation.